When you register with the Website, you can elect to provide us with contact information, such as your name, physical and electronic address, phone number, and other similar contact details to receive information and updates on our products and services, as well as those of our subsidiaries, affiliates, and parent companies and any of their related businesses as well as those of our third-party partners. By providing registration information, you agree that your name and address, but no other registration information, may be provided to third parties for marketing purposes in accordance with Section II below. We use return email addresses to answer the email that we receive, and we may use return email to send you other information. Such addresses are not used for any other purpose. You can opt out of allowing us to provide your name and address to third parties by visting your contact preferences. When an order is placed or when a consumer enrolls in the Angel program, the Company requests data from users including: contact information such as name and shipping address; financial information such as credit card number, expiration date, billing address, and billing phone number. This information is used for billing purposes to verify that the customer is of legal age, and to fill customers' orders. If we encounter difficulty when processing an order, this contact information is used to contact the user. This information is harvested from a secure area and encrypted for our customers' protection. It is not sold or shared with anyone else under any circumstances, with the limited exception of order dates and amounts paid, which are shared only in accordance with section II below. Cookies and other user tracking devices (e.g., locally stored objects) may be stored in your computer's hard drive when you visit the Website. These tracking devices may also be used to help us speed up your future activities or to improve your experience by remembering the information that you have already provided to us. We do not use these devices to retrieve information from your computer that was not voluntarily provided by you. The use of these devices is an industry standard. Some of our business partners may also use these devices to provide us with anonymous data and information regarding the use of the Website. At your option, you may block or delete tracking devices from your hard drive. However, by disabling such tracking devices, you may not have access to the entire set of features of the Website. For information on how to disable and manage such tracking devices, visit http://www.aboutads.info/consumers/. We may use your personal information in order to communicate with you about our products and services and those of our subsidiaries, affiliates, and parent companies and any of their related businesses and those of our third party partners. By using the website, you agree that we may arrange for selected organizations to send you marketing and promotional information that may be of interest to you. Your name and address (but not your email address or phone number), as well as transaction information such as order dates and amounts paid for orders (but no private financial information) may be disclosed to these organizations. 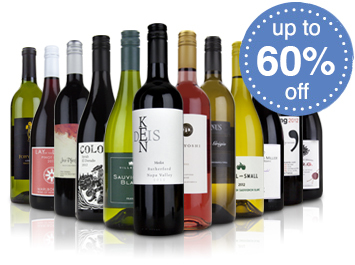 You can opt out of allowing us to provide this information by visiting us.nakedwines.com. In addition, we may share non-personal information with others, such as advertisers, in aggregate, anonymous form, which means that the information will not contain any personally identifiable information about you. Information that you post on or through the public areas of the Website (e.g., chat rooms, NakedMe, bulletin boards, and discussion groups) are generally accessible to, and may be collected and used by, others and may result in unsolicited messages or other contact from others. Users of the Website are encouraged to exercise caution when providing personal information about themselves in public or interactive areas. Our policies and procedures limit access to personal information to those with a business reason to know such information. We have put in place reasonable physical, electronic, and managerial procedures to safeguard the information we collect. However, due to the open communication nature of the Internet, we cannot represent, warrant, or guarantee that communications between you and us, or personal information stored on our servers, will be free from unauthorized access by third parties, loss, misuse, or alterations. THE COMPANY DISCLAIMS ANY AND ALL LIABILITY FOR UNAUTHORIZED ACCESS OR USE, OR COMPROMISE OF YOUR PERSONAL INFORMATION SUBMITTED THROUGH THE WEBSITE. USERS ARE HEREBY ADVISED THAT THEY SUBMIT SUCH PERSONAL INFORMATION AT THEIR OWN RISK. You may request that we provide you the information we hold about you, update your information, or ask us to remove your information, or to correct any inaccuracies in such personal data by sending an email to chat@nakedwines.com. We will use reasonable efforts to deal with your request within a reasonable time. The Website may include a referral service that allows you to tell a friend about the Website or certain content on the Website by submitting your friend's name and email address to us. We will automatically send your friend a one-time email inviting him or her to visit the Website. The Company stores this information for the sole purpose of sending this one-time email and tracking the success of our referral program. Your friend may contact us at chat@nakedwines.com	to request that we remove this information from our database. Residents of the State of California have the right to request from certain businesses with whom the California resident has an established business relationship a list of all third parties to which the business, during the immediately preceding calendar year, has disclosed certain personally identifiable information for direct marketing purposes. We are only required to respond to a customer request once during any calendar year. To obtain this information, you should send a request to chat@nakedwines.com	with the subject heading "California Privacy Rights." In your request, please attest to the fact that you are a California resident and provide a current California address for our response. Please be aware that not all information sharing is covered by the California Privacy Rights requirements and only information on covered sharing will be included in our response. This counter shows how many Angels we have right now. Angels are real people. Normal wine drinkers just like you. Meet them and ask them anything, here. By funding winemakers upfront we're able to remove a huge chunk of costs that in a traditional wine business would be passed on to you, the customer. Costs like sales and marketing. It also means the winemaker can spend more time in the vineyard and less in the office. Which means the wines taste better. It's a win, win. 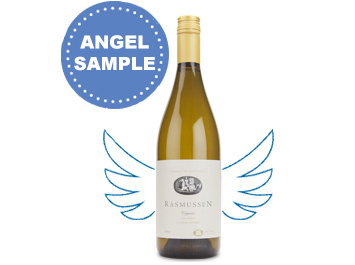 Each month our winemakers reward Angels with a gift bottle of something nice. It's popped straight in your online basket ready for when you order a case. It's their way of saying thank you. Husband and wife Adrian and Rebecca Santolin had always dreamed of making their own wine. In 2011 they scraped together every penny they had to make 1 barrel of wine (about 200 bottles). In 2014, thanks to Angel funding, they will make 45 barrels. And they couldn't be happier! 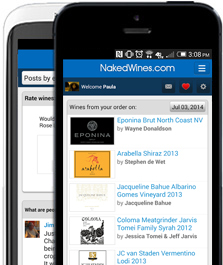 The free nakedwines.com mobile app helps you get the most out of being an Angel. Chat to winemakers directly, ask them questions or give them your feedback. They'll respond to you directly! Beats playing Angry Birds 9 times out of 10! Get all this by depositing $40 a month in your Naked piggy bank. Yours to spend on any of our wines whenever you want. Or get it back if you don't. Simple as that. We're going to have to give you some MORE wine. Right now, we are fully subscribed. As an apology, here's some wine on us. Get three Angel-funded wines when you put your name on the Angel waiting list. The waiting list is necessary to ensure Angel numbers don't grow out of control and put the high level of service and delicious wines we provide to our existing 100,000+ Angels at risk. Right now, we think you should only have to wait around 31 days, but we'll keep you posted as you near the top of the list. As an apology for the wait, and to get a sneak peek of what awaits you as an Angel, we've added a bonus three pack of Angel-funded wines in your basket — yours if you sign up to become an Angel today. Simply click the green button below then checkout with 9 other bottles (i.e. 12 in total with your 3 pack).